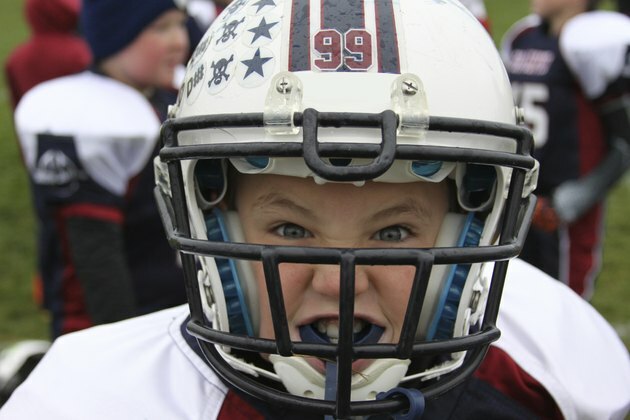 While most children in youth football leagues enjoy playing the game itself, they may lack the patience required for all of the drills and conditioning they need to make them into football players. A good coach will take the age of his players into account, and find fun ways to motivate them, so that the drills themselves seem like games that the kids will want to play. While this is a drill for quarterbacks and receivers, most youth football leagues will train kids to play all positions, so it is a drill that can be practiced by the entire squad. Divide the squad up into quarterbacks and receivers, and pair them off, with each pair standing about 10 yards apart. The coach then controls the drill by shouting out a sequence of commands, at which the quarterback or receiver is to perform a specific action, and then both players will freeze until the next command is given. The one exception is with the commands to throw and catch the ball, as the coach should give these commands sequentially without a pause in between, and the receiver is to catch the ball as soon as it is thrown without pausing to wait for a command to do so. The commands, in order, are as follows: Ready! (quarterback assumes throwing position), Go! (quarterback throws ball to receiver), Catch! (receiver catches the ball, then freezes until the next command is given), Tuck! (the receiver secures the ball, keeping his head down and eyes on the ball), Toss Back! (the receiver throws the ball back to the QB). This drill can be repeated three times, once with a low ball, once with a medium one and once with a high one. Have all of the players form a ring, then choose one player to stand in the middle. The coach will throw the ball to one of the players in the ring and that player must then try to run the ball across the circle. The player in the middle, the "bull," must try to stop the runner with a tackle. If the runner makes it across, the bull remains in the center for another turn. If the tackle is successful, the bull then joins the ring and the runner takes the center spot. The coach then throws the ball to another player in the ring, and the drill continues from there. Although some leagues and school districts have banned this drill as being "too dangerous," it is no more dangerous than any other type of full-contact drill. The coach should take care, however, when throwing the ball, to select a receiver who is not significantly smaller than the tackler, and should not let this drill go on for too long, with any one player being tackled multiple times. This is a drill meant for summertime practice, at the end of a hot day. When the kids are running ladders, have some parents or other helpers lined up on each side, armed with small water balloons. The helpers are to toss the balloons at the players, and as each player is hit, he is out. The last player to be hit is the winner. As the fastest, most agile runners tend to be the ones who can avoid the balloons the longest, this drill really seems to motivate the kids to do their best. It also has the benefit of allowing everyone to cool off after the workout and can itself be used as a motivator. Perhaps you could even allow the kids to throw a few water balloons at the helpers after a successfully completed drill.